KitMonsters – Fender Mustang. The music makers’ guide to making music. The Mustang was first produced in 1965 as a junior or student model and became popular for surf music and later with alternative bands. 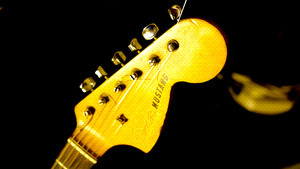 The neck options of the original are shorter than the Fender Stratocaster or Gibson Les Paul and have a reputation for being easier to use for people with small hands. The shorter neck also helps with use of the famous tremelo arm. It has two single coil pickups and an unusual phase slider on-off switch for each. It has been used by artists such as David Byrne, John Frusciante, Kurt Cobain, and Todd Rundgren. 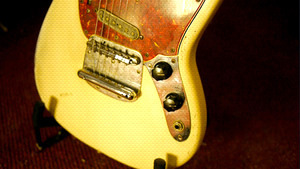 Fender have re-issued it over the years including as a 2011 Pawn Shop series. 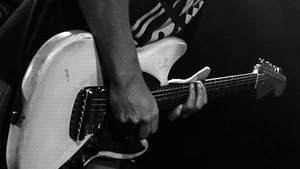 Most recently a Kurt Cobain signature Mustang was issued in 2012 with some special features that Cobain had in his customised Mustang, such as a Seymour Duncan JB humbucker in the bridge and a normal Mustang single coil in the neck. It comes in right and left-handed versions. Original models are highly prized.